Seabee’s foundry operation started in 1981 with six one-ton induction furnaces. In the years that followed, the foundry has doubled in size and capacity. 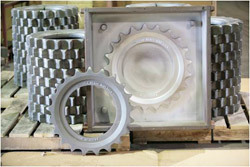 Today, we provide various industries with castings ranging from low alloy to carbon steels to corrosion and heat resistant steels and special alloys. Additionally, we possess a full line pattern shop, machine shop and heat treatment capabilities. Our strength lies in our ability to quickly and cost effectively produce medium to low quantity runs. We have a broad base of small to medium customers covering all types of industry, and we specialize in short run complex parts. If you have a casting that other foundry’s either won’t do or are simply too expensive, that’s when you should contact the Seabee Foundry. For our customer’s that do not have their own patterns we have the resources to make or modify patterns locally or in our own facility. Casting geometry can be sent via blueprint or electronic transfer of computer aided design files. Melting Equipment: 6 one-ton induction units. Monthly Capacity: 180 tons per month. Mold and Core Processes: 100% No Bake (Pep Set, Chemically Bonded Sand). Run Quantity: 1 mold and up, no minimum. Alloy Type: Low Alloy, Carbon Steels, Corrosion and Heat Resistant Steels, and Special Alloys on request. Test Capabilities: Spectrograph, Ultrasound, Liquid Penetrate, and Hardness Testing. Other Capabilities: Heat treating (normalizing/annealing), full line pattern shop, and machining capabilities. For Heat Treating requirements outside of our internal capabilities we use professional commercial certified heat treaters.